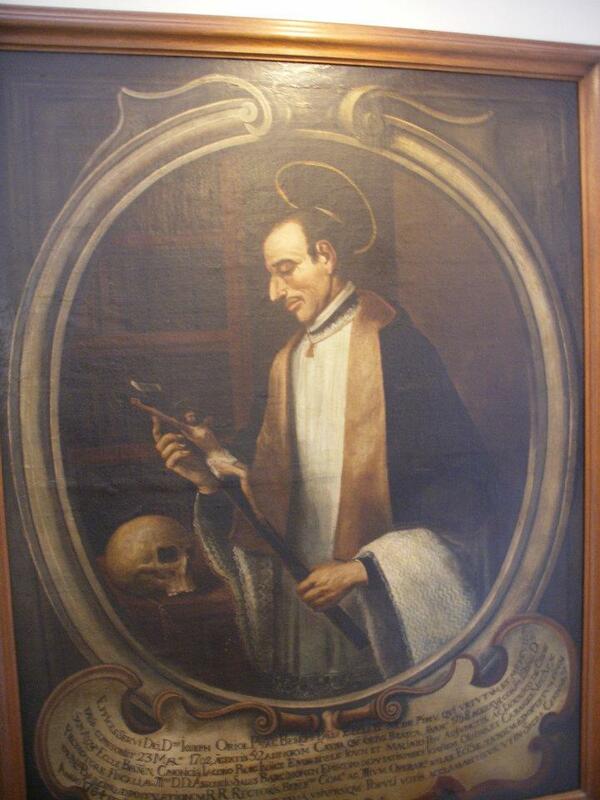 San José Oriol (Barcelona, 23 November 1650 – 23 March 1702) was a priest from Barcelona. He is venerated as a saint by the Catholic Church and is the object of particular devotion in the city of Barcelona. He is called the “Taumaturge of Barcelona”. At a time when public health care was non-existent and only the rich had access to health professionals, he gave himself to the sick and cared for them with the means at his disposal: he washed their wounds, gave them ointments, gave them homemade remedies, cared for them and prayed with them. In June 1687 he began to work as a beneficiary of the church of Pi and, from the first moment, every end of the month when he received his share of the benefit, the poor already waited for him at the door and he distributed almost everything to them. This beneficial task and his austerity would lead him to be known as “Doctor Pa i Aigua”. San José Oriol was born in carrer d’en Cuc (today, Mare de Déu del Pilar) on 23 November 1650 and was baptised in San Pere de les Puel-les on the same day. He was the youngest son of eight siblings of Joan Oriol i Vaquero and Gertrudis Bogunyà i Martí. As a child he lived in the Ribera district. An altar boy of Santa Maria del Mar, he studied at the University of Barcelona, obtaining the degree of Doctor of Theology on August 1, 1674. With the obtaining of a small profit in the sanctuary of the Mare de Déu de Bell-lloc, near Palamós, he was ordained a priest on 30 May 1676 in the palace of the bishop of Vic. On 29 June 1676 he sang his first mass in the church of Sant Pere de Canet de Mar, the place of residence of the Milans who were friends and protectors. One of the main members of this family, Marc Antoni Milans i Macià, years later, would entrust to the future saint the education of his son Tomás Milans i Godayol, who became an outstanding Catalan musician and composer. At first he served as a priest in the Oratory of Sant Felip Neri, an institution to which he was bound by close friendship and, above all, a strong doctrinal bond, and also as a preceptor of the sons of an Italian military knight living in Barcelona by the name of Gasneri. In the house of this knight occurs one of the miraculous episodes lived by the young priest and that will lead him to adopt a life of poverty and penance. Prayer and meditation following the doctrinal principles of quietism, a kind of seventeenth-century Zen, once led him to be even investigated by the Inquisition, although without consequences. This quietist spirit is one of the main features of his spirituality. His main ministry was always linked to the Parish of Santa Maria del Pi from which he was named beneficiary in 1686. From that year on, he occupied numerous positions within his community, especially in that of passionate person who led him to have to visit and take care of the sick and the poor of the parish. Over time, through this ministry, he became very popular among the people of Barcelona and the fame of his thaumaturgical charism spread throughout Catalonia. Desiring martyrdom, he went to Rome in April 1698 to offer himself as a missionary to distant lands, but fell ill in Marseilles and returned to Barcelona. From that moment until his death, Doctor Pa i Aigua, as he was known in Barcelona for his life of penance, developed the charism of healings in the Chapel of the Blood or the Blessed Sacrament of the parish of Pi, which led him to be loved by the people. On March 23, 1702, in the street of Dagueria, he died after a short illness that he himself had prophesied a short time before. His burial, through the streets of Barcelona, was a remarkable event that was attended en masse by the population of the city. By order of Bishop Dom Benet de Sala, the funeral procession followed the same itinerary as the Corpus procession with his body deposited on the bed used by the Sleeping Virgin which was celebrated on 15 August. He was buried in the chapel where he exercised his priestly ministry and where he still rests. In 1759 the process of beatification began at the request of a commission formed by citizens of Barcelona and parishioners of Pi and on September 5, 1806 was beatified in Rome by Pope Pius VII. He was canonized in 1909, at the request of Cardinal Salvador Casañas y Labrador, bishop of Barcelona and former rector of the parish of Pi, who was very devoted to the saint. From the Basilica of Santa Maria del Pi website.